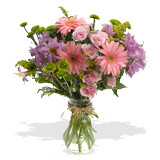 $80 - $100 Best Seller Flowers Rose flower bouquets and tulip flower bouquets are some customer favorites at FlowerFresh. We are committed to providing you the highest quality fresh flowers at the best possible prices. Our elegant tulips may have travelled all the way from Holland , referred to the as the "land of tulips", due to the integral role tulip flowers have played in Holland's history. Our Best selling bouquets are a good place to get inspiration if you are confused about what flower bouquet to get.